Coaching For Enhanced Performance offers both standard and customized business training and business coaching programs for audiences ranging in size from single digits to 100+ participants. These programs are offered in half-day or full-day formats and can be delivered as stand-alone sessions or as part of a more comprehensive meeting agenda or skills training initiative. When individual or 1-on-1 performance coaching may be a consideration or an identified need, Coaching For Enhanced Performance will work in conjunction with that employee and his/her management to create as well as support a customized performance management plan consisting of specific behavioral goals and objectives and a definitive timeline for implementation and follow-up. With more than 30 years of sales, management, human resources and business coaching experience to offer, Coaching For Enhanced Performance is committed to understanding and supporting your individual and team development needs. Once you have the opportunity to review the business coaching services and training programs highlighted within these pages, Coaching for Enhanced Performance would be pleased to arrange a no-obligation consultation at your convenience. 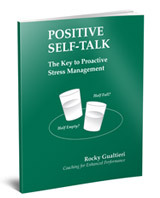 Focuses on stress as an internal pressure; what you do to yourself to cause or create that stress, then provides insight on what you can do proactively to aid yourself in managing or relieving that feeling.